This ornate ivory pipe is engraved with figures and scenes and the terracotta bowl is decorated with a pottery frog and enamelled flowers. Heated opium would have been placed in the top of this bowl and the fumes inhaled through the pipe. Opium is a very powerful drug. Medicinally it was used for pain relief and inducing sleep, but over the centuries many people have become hopelessly addicted to it. By the late 1700s, opium had been used in much of Asia for several hundred years. In China, for example, opium had been in use medicinally since Arab traders brought it from the Middle East in the 600s or 700s CE. 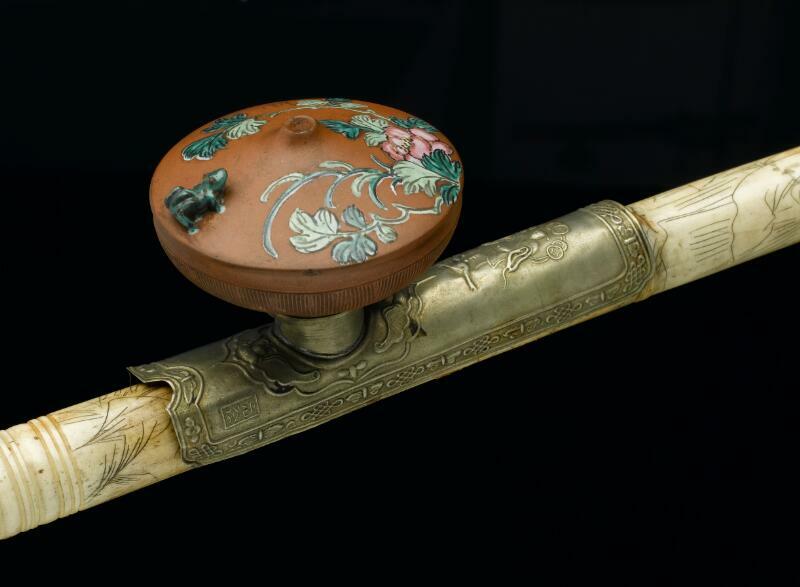 Styles of opium pipe reflected the relative wealth or poverty of their owners and ranged from bejewelled, elaborately ornamented works of art like this one to simple constructions of clay or bamboo.